You couldn't call my relationship to the music of Conlon Nancarrow "love/hate". It's more "like/dislike". 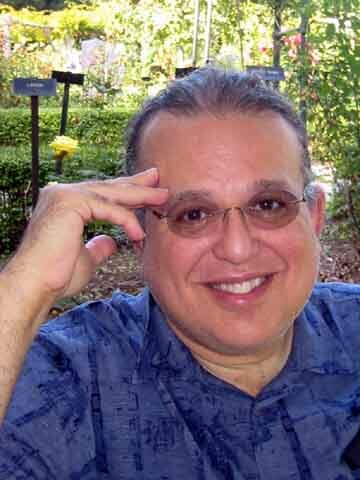 On the one hand his Studies have a jazzy, powerful, propulsive energy filled with spellbinding rhythms and spectacular gestures. That's the "like" part. But the sound of those extra-bright player pianos wears on me. I lose interest pretty quickly. 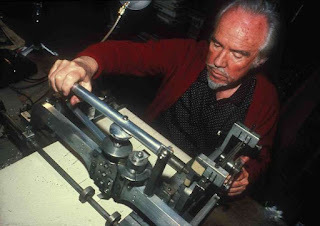 The importance of Nancarrow, to me at least, is that he pioneered the notion of the loner composer. He was the first to write music for a specialized musical device which gave him complete control over all aspects of his music. That device played the completed finished pieces. No performers were involved. As technology has improved over the decades, especially with digital instruments, being a loner composer has become more and more common. These days a relatively modest investment in computers and software is all it takes to start making music far beyond the capabilities of any performer, real or imaginary. This is the way I compose and I'm very happy doing it. I suppose some people are still scandalized by these developments. If you're such a person, remember that this method of composition is never going to eliminate composers who write for live performers. It does, I think, force them to write music for the real strengths of performers. These strengths include the abilities to interpret and improvise. Also, this is also not going to eliminate live concerts. That's because aspects of live performance, notably something which might be called the 'spiritual' component, that ineffable communication between performer and listener, can't be approached by digitally created performances. Conlon Nancarrow's music and methods were not precursors to the sequencers, samplers and electronica of today. I'm not aware of anyone still writing music for player piano. But he was the first to demonstrate that a composer can have a different relationship to listeners, not by imagining music and then giving it to instrumentalists and singers to perform, but by actually making the music directly using specialized tools in a studio,an analog of the way painters or sculptors do their work. When finished, the results are shared immediately with an audience. Produced by James Greeson and Dale Carpenter, this documentary starts with Nancarrows childhood years, covers his politics and involvement in the Abraham Lincoln Brigade during the Spanish Civil War, his move to Mexico City in the 1940s and then his subsequent discovery and late-in-life fame. There's a section about the composer Trimpin who is hailed as a kind of successor to Nancarrow. There are talking heads aplenty and a couple performances of early piano works, ones Nancarrow intended for flesh and blood pianists. The most interesting part, however, which inspired me to write this post, is that this video allows you to actually watch the player pianos playing Nancarrow's piano rolls. Not just the roll rolling past the tracker, but the actual internal workings of the piano itself - levers flexing, gears turning and wheels whirling. This is something I've never seen before and I found it particularly riveting. 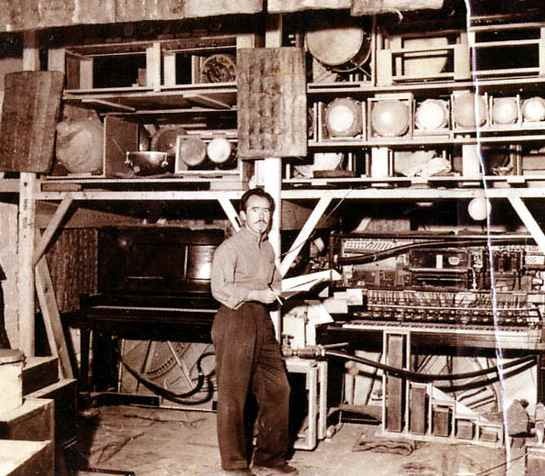 During Nancarrow's years of fame his music was performed in concert all over the world - but almost always by tape recordings, not with actual player pianos. I saw such a concert in Los Angeles - mid-eighties, I guess. It was at the Japan-America Theater. The composer was present and he engaged in a question and answer session with the audience, moderated by composer William Kraft. In this documentary, at one point, a talking head refers to Nancarrow as "shy". That's a good description of how he answered the audience's questions. He gave us virtually no information, preferring to quietly avoid questions. It became kind of funny. Earlier in the concert there had been a presentation about his life and work. One picture showed a shelf of books about theories of time - a subject one would imagine to be of considerable interest to a composer who wrote music in multiple tempi. 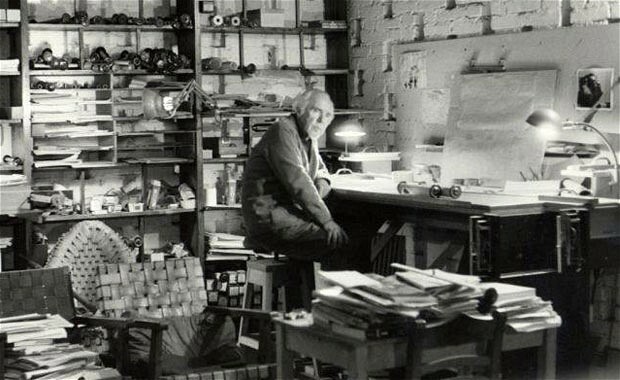 Nancarrow's extensive library is shown and discussed in this new documentary as well. As someone who long ago had been influenced by my own readings about time, I decided to ask him if he found any particular books on the subject influential. No, he replied quietly, he couldn't think of any. Here's an interview with Nancarrow in which he is considerably more informative. This documentary is, apparently, nearly finished. Here's an additional sequence of talking heads, apparently cut from the video, talking about Conlon's relationship to food: eating fried worms, drinking tequila, eating one fruit while looking at another, his kitchen where he cooked paella or ground curry powder.